In this Valeera Build Guide, we provide an overview of her strengths, abilities, talents and matchups. 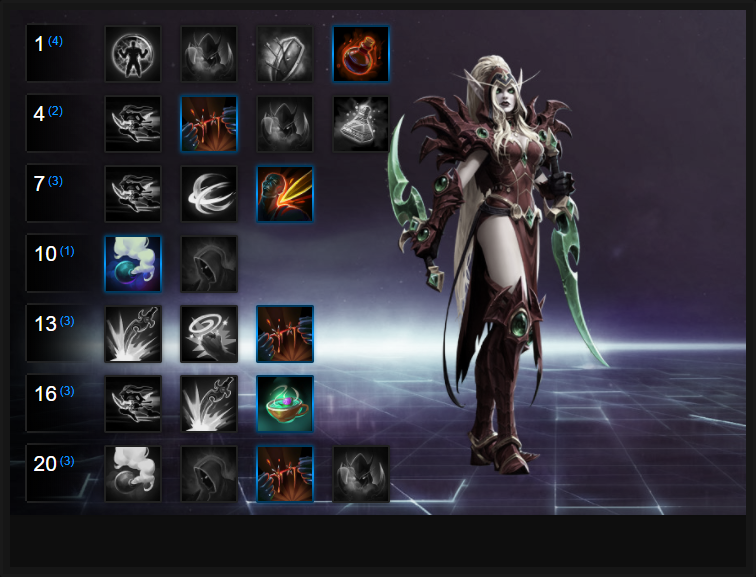 Valeera is a melee assassin that unlike others, has two sets of abilities. Her first, when she's visible, provides the majority of her mobility and damage. The second is when she activates her trait, which provides utility in the form of a silence or stun. Weaving both sets of abilities is key to her damage potential, but also fundamental in allowing her to quickly acquire Combo Points. Identical to a Rogue from World of Warcraft, Valeera must build Combo Points to utilise her "execute" ability; Eviscerate. All her abilities - regardless of which you use - grant one as a minimum, up to a maximum of 3. Key to her play is knowing how to not only acquire Combo Points quickly, but to also manage your energy. Valeera's core mechanic is a Combo Point system almost identical to the Rogue in World of Warcraft. She can obtain a maximum of 3 and each basic ability grants 1. In order for her to utilize her finisher, Eviscerate (see below), she needs to build Combo Points before spending them. With each ability granting 1 Combo Point, it's down to you to not only manage these and when to spend them (you gain 30 seconds before all earned Combo Points expire) but to also manage your energy. Valeera cannot simply spam her abilities back to back in order to quickly gain Combo Points as she is bound by her energy resource and its gain. energy is automatically accrued at 1 per second, up to a maximum of 100. Using three abilities will - typically - exhaust all her energy. This subsequently limits your damage potential and how quickly you can earn Combo Points. Taking talents that provide more Combo Points or which increase your energy Gain are key to quickly gaining both. Vanish (Trait) - Allowing Valeera to stealth, Vanish provides 20% movement speed and becomes. Similarly to Zeratul or Nova's Cloak, Vanish allows Valeera to be partially visible, though she can still be spotted by eagle-eyed players. 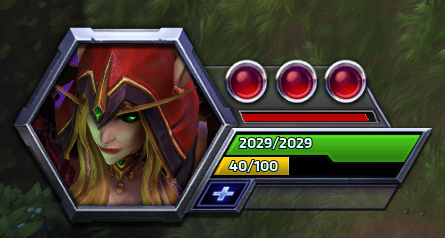 What's particularly powerful about Valeera's Trait is the fact she turns invisible when stationary, while gaining three new abilities from stealth, all of which off significant amounts of utility. Not only that, but she can also teleport a short distance to an enemy when activating these abilities. Considering Vanish only has an 8 second cooldown, you'll rarely be without it. Finally, her Heroic abilities are all usable even when she is stealthed. Ambush (Q Trait) - Ambush is her signature "burst" opener from stealth and allows her to deal instant high damage to a single target. Awarding one combo point, Ambush is more than capable of instantly killing a low health Hero and will add huge pressure to anyone not expecting her attack. The armor debuff (-10) also allows her team to deal that little bit more damage. Cheap Shot (W Trait) - Cheap Shot provides a lengthy stun (0.75 seconds), awards 1 Combo Point and blinds targets. Against any Hero using a channelled ability it will stop them instantly, with the duration more than long enough to obtain maximum Combo Points (3) before using Eviscerate. The blind is particularly powerful when opening on a Hero such as Valla or Zul'jin. Garrote (E Trait) - A damage over time ability that also silences for 2.5 seconds (also awarding 1 Combo Point) Garrote can comfortably pressure a high value target for a prolonged period of time as its duration lasts for 7 seconds. The fact its silences for a little over 2 seconds is enormous, especially considering it's available at level 1. If you can use it against the enemy Support early on in a team fight, you and your team can quickly clean up. Sinister Strike (Q) - As your only form of mobility, Sinister Strike is a short range dash that deals moderate damage. Should you impact against a target behind the maximum distance, you will instantly stop and its cooldown is reduced to 1 second. With an energy cost of 30 you can use 3 before you're (almost) out of energy. Sinister Strike is your bread and butter ability and when outside of Vanish will use it the most. Should you have the energy and the need to, don't be afraid to use it to disengage. Awards 1 Combo Point. Blade Flurry (W) - As your only form of AOE damage, Blade Flurry is an instant short-range radial attack that deals damage around Valeera. At a cost of 40 mana you can only use it twice before exhausting your energy and like Sinister Strike, it also awards 1 Combo Point. What I will say is that in terms of damage versus energy cost, Blade Flurry is best used when you're taking camps, clearing minions in lane or if you happen to find yourself amongst a close group of enemy players where you can snag more than one at once. 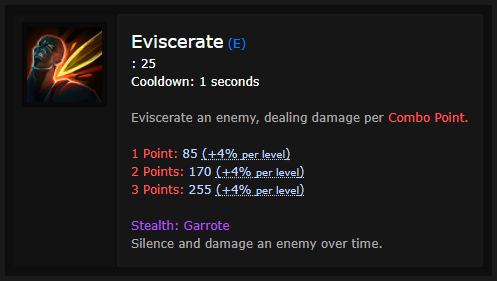 Eviscerate (E) - Your finisher and as your highest damage ability, Eviscerate is designed around your Combo Points with its damage increasing based on the number you have. At 3 Combo Points, the damage is huge and considering the fact it only has a 1 second cooldown, it's incredibly easy - should you have the energy - to wrack up the damage. Be aware that you can use Eviscerate even with 1 Combo Point but its damage is reduced (it effectively doubles each Combo Point). Smoke Bomb (Heroic) - Smoke Bomb is a particularly interesting Heroic because it creates a small area where Valeera is Unrevealable (she cannot be removed from stealth) and during this time, not only can she pass through other Heroes but she also gains 25% damage mitigation from all sources. Using abilities in the Smoke Bomb doesn't reveal Valeera and although the radius is small, it can really cause problems for enemies you catch in it. Effectively you can deal damage freely without being targetable by the majority of attacks. AOE skills can still hurt you such as Xul's Spectral Scythe or Kaelthas' Flame Strike but neither will pop you out of stealth. All the while you're freely able to damage others and should you leave the Smoke Bomb, you gain a brief moment of stealth to run away. It's brilliant. Cloak of Shadows (Heroic) - A niche Heroic revolving almost entirely around shutting down spell casters, Cloak of Shadows provides 75% reduced damage against ability damage. Against the likes of Kael'thas, Nazeebo, Li Ming, Jaina amongst many others, this is enormous. Not only does it reduce incoming damage by 75% but it also cleanses Valeera of damage over time effects and makes her Unstoppable. The downside to this is that it only lasts 1.5 second but it does have a relatively short cooldown. Personally I consider it the weaker of the two but if you're against an ability heavy composition with a lot of crowd control, it absolutely will save your life. Crippling Poison is a brilliant Talent as it allows you, from level 1, to gain a 20% slow for 4 seconds. Best of all, it doesn't break Vanish so you can comfortably use it and then unleash your damage. Considering it also has a 15 second cooldown, there's rarely a time when you won't have it. Taking Hemorrhage is worthwhile if, at level 7, you want to take Slice and Dice. It allows your basic attacks to deal 50% more damage against your target while your DOT is active and when paired with Slice and Dice (see below) ensures you attack fast and hard. Slice and Dice is an exceptional Talrent as it allows Valeera to increase her basic attack speed by 150% after a 3 Combo Point Eviscerate. Although its duration is short, it's more than enough time to get multiple attacks in. Combined with the damage bonus of Hemorrhage, Valeera is capable of dealing massive, quick damage. Without doubt her strongest Heroic, Smoke Bomb makes Valeera Unrevealable as long as she remains in its radius. Not only this but she gains a 25% reduction in damage she receives, cannot be targetted (though is still affected by AOE) and is able to use abilities without being revealed. It's amazing. Strangle allows Valeera to build on her Garrote, allowing her to reduce an opponents Spell Power by 40%. Used against a Support Hero, the reduced potency of abilities combined with the ridiculously long silence allows Valeera to lock down just about anyone. Thistle Tea instantly restores Valeera's energy to full (100) and is effectively a full reset on your abilities as you'll be able to use twice as many attacks as you did previously: you can also use it while stealthed. Ideally you want to use Thistle Tea after your opener, if you need to remain in combat to finish someone off or to retreat with Sinister Strike before repositioning. Completing the Garrote build, Rupture allows Valeera to refresh the duration of her DOT when she uses her basic attacks, while it ensures she can maintain Hemorrhage near permanently. Best of all, it increases the damage of Garrote by 100%. These Hero Threat Levels (1 being lowest threat and 10 being highest threat) are to help you determine which enemy Heroes can give you a headache. For the Heroes listed here, take extra care as they're particularly dangerous for Valeera. Lunara: Her mobility, nuisance poison and vision make her a challenge for Valeera. You can burst her down quickly but a skilled Lunara will be able to spot you, poison you and chase you down. Thrall: His root, ranged poke and self healing are very difficult to deal with. If you do open against him, he'll root you, replenish his health and kill you quickly. The Butcher: You can't really kill him unless he's near death and if he sees you out of stealth, one Onslaught and you're in trouble. Illidan: Evade, self healing, mobility, damage - he's a headache you just can't get rid of and your Vanish won't neccesarily save you if it's not immediately available. This list of tips and tricks are just a handful of things we think will help your Valeera play. We'll continue to add to the list as required and if you have any tips you'd like to share, let us know in the comments below and we'll place them here. 1. Management of your Trait Abilities (in Vanish) and basic abilities when visible is key to effective Valeera play. You need to determine who your target is and choose an appropriate ability to open with. Do you want damage? Will a stun be more useful for you and your team? Should you silence them? Reading the fight and making this decision is incredibly important. 2. Like any stealth class, Valeera is very squishy. She can often escape easily with Vanish but skilled teams can lock her down easily with crowd control or AOE effects. Choosing your positioning carefully. 3. Enemies can still see you when stealthed as like Nova or Zeratul your Stealth shows a "shimmer". Try to stand still on the edges of a fight until the right moment so you turn Invisible. 4. Valeera is actually pretty good at soaking lanes thanks to her AOE damage from Blade Flurry. Don't be afraid to do so when needed. 5. Valeera is amazing at shutting down high value targets such as Auriel or Malfurion. Whether you silence or stun them, she can work wonders against them. 6. Valeera is one of only two Heroes in the game to gain a Silence at level 1. Use this as much as possible during a team fight (at the start, anyway) to cause real problems for the opposition. 7. Smoke Bomb is best used in enclosed spaces or at a time where you need somewhere to retreat back to. Don't be afraid to drop it in the middle of a fight (such as when Punisher's are activated on Infernal Shrines). Even if you leave the smoke cloud, you've 5 seconds to return to it. 8. It's often worth using Garrote against Heroes such as Lt. Morales as it'll pressure them for 7 seconds, providing a continuous tick of damage they can't do anything about. 9. Your job as a stealthed assassin is to kill players quickly. Always try to open up on high value targets that are squishy - it's totally pointless attacking a Warrior unless they're nearly dead. 10. Don't feel you have to waste your combo points. Even if you have 3, you've 30 seconds to use them before they expire. Feel free to kill a target with your basic abilities or attacks and then open with Eviscerate on a new target. 11. Valeera has absolutely no ranged attacks. You have to factor this in when drafting, especially on Battlegrounds that require objective defence (such as Battlefield of Eternity). 12. Your only form of engage and/or escape outside of Vanish is Sinister Strike but it only has a range of 5 units. It's this or your Vanish. 13. Try to keep an eye on your energy at all times. By default you have 100 and you regain 1 per second. You can only cast 3 Sinister Strikes, 2 Blade Flurry before your pool is exhausted. Also be aware that Eviscerate requires 25 energy before it can be used. 14. Ideally and for an instant 3 Combo Points you want to open with any ability from Vanish (+1), follow up with two Sinister Strikes (+2) before using Eviscerate. 15. When Valeera begins to talent she can acquire 3 Combo Points from just two abilities - this saves her energy use and allows her to burst quickly. Thanks for reading our Valeera guide! You can now help support Ten Ton Hammer, so we can keep writing guides like this.